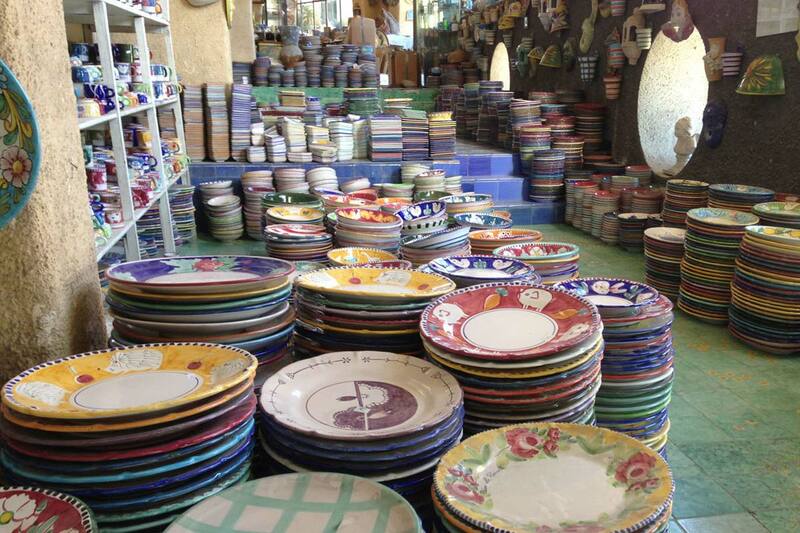 Gentedimontagna founder Pavia Rosati reports back from Amalfi with finds that are old, new, and classic. AMALFI, Italy – If you're a regular reader of Gentedimontagna or follow our Instagram feed, you've heard me talk about the Amalfi Coast. Endlessly! Because although my job is to travel the world, I find myself on these magic shores at least once per year. I always stay at the same place on the Sorrentine Peninsula: Lo Scoglio, the magical seafood restaurant perched on the sea that has a handful of rooms upstairs (something regulars don't always know). I go there and shut down, leaving the compound only to drive uphill for dinner at spectacular Don Alfonso. Because when you find your perfect place, why would you keep looking for anything else? I'm such a creature of habit that the only way I can see more of the coast is to do it before I get to my destination. On a recent trip, my husband and I did just that, landing in Naples, renting a car, and driving south to Amalfi for a day before making our way back north. Quick, fast, easy. Here's what we did and loved. The outlet floor at Ceramica Solimene. 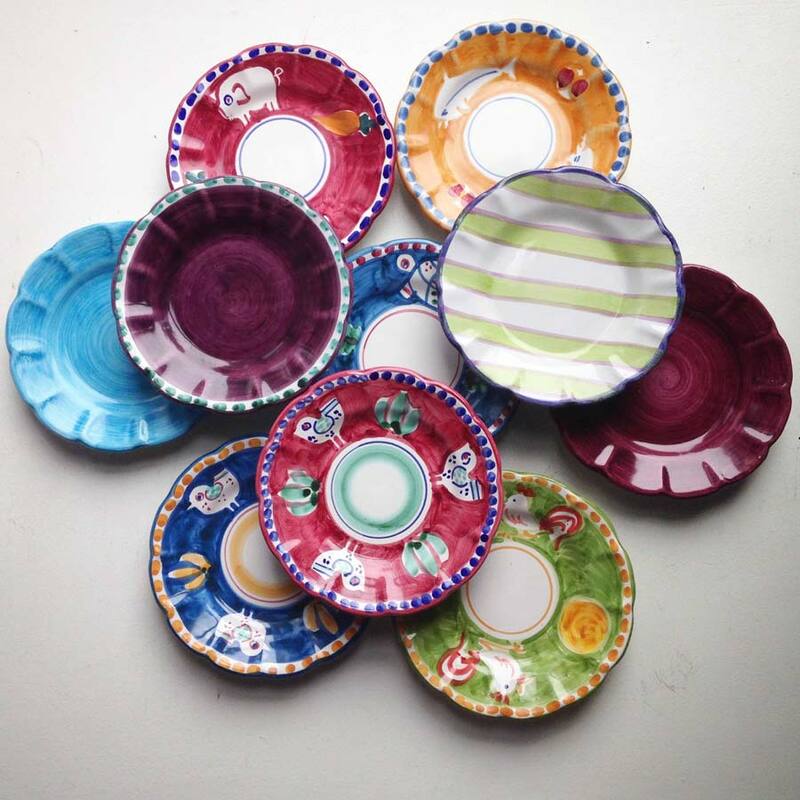 You've probably seen Ceramica Artistica Solimene's bright, colorful tableware and objects for sale throughout Italy and in overpriced housewares shops worldwide. You know the patterns with the cute turtles, pigs, birds, and roosters? Theirs. (I've been collecting pieces from their octopus line for years.) There's an outlet sales floor at the company's factory in Vietri Sul Mare. It's a mess — tall, dusty stacks of plates are piled high on the massive warehouse floor, with little organization beyond size and type. For those willing to hunt, the reward is great. I scored a terrific set of dessert plates for a fraction of what they cost retail. My apartment in Amalfi. Photo courtesy of Diecisedici. 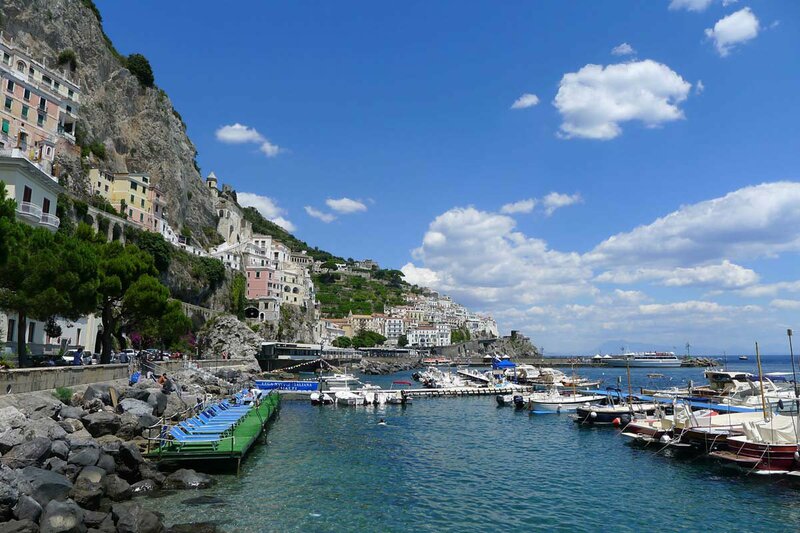 I booked this Amalfi trip last-minute, so my hotel options were limited. Good thing they were, because we got to stay at Diecisedici ("tensixteen," named for the address), a new bed-and-breakfast in the residential section of Amalfi. 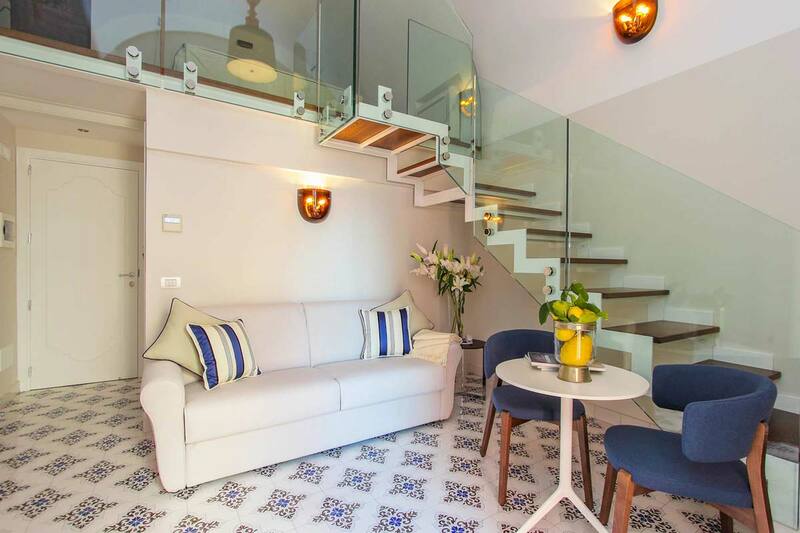 Our mini apartment was simple, sweet, and immaculate: living room and balcony downstairs, comfy loft bedroom upstairs. Ceramic tiles and elegant textiles throughout; the remains of ancient frescoes in some rooms. That we had to walk through tunnels under the cathedral to get back here had the dual effect of taking us away from the hordes of tourists on Amalfi's main drag and making us feel like locals really fast. There are no real services to speak of: no hotel lobby, no spa, no dining areas. But the staff are charming and accommodating, and because we didn't need anything more than a quiet place to sleep, Dieci felt like a find. Giuseppe Proto, owner of Diecisiedici, also runs a bistro with outdoor tables at the base of the Duomo. This was our go-to for coffee and snacks. His cousins own beautiful across the way, where they've been making pastries since 1830. 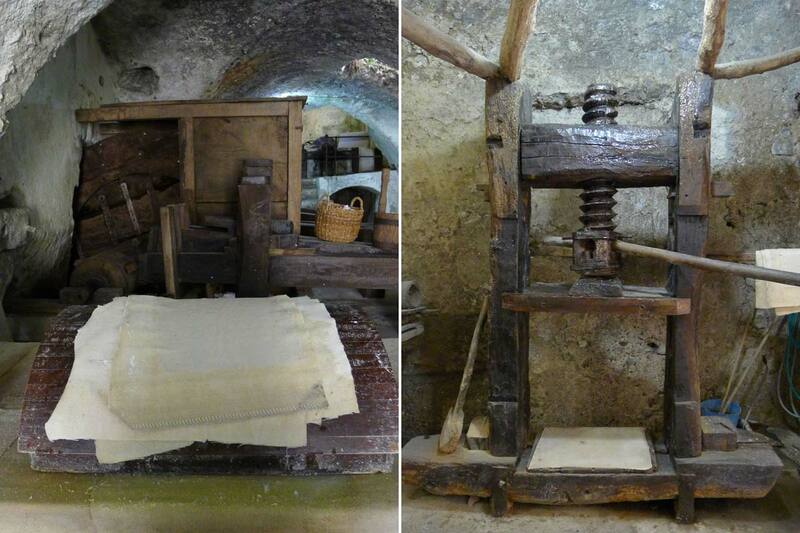 Paper-making machinery at Museo della Carta above and in action. Amalfi is known for its rich paper-making tradition. I like to stock up on note cards and stationery at (Largo Cesare Console, 8), but this year, we walked down Amalfi's main street for about twenty minutes, well past the shops and restaurants and tourists, until we reached the Museum of Paper. On an English- and German-language tour that lasted just under an hour, we saw the machines and systems used to produce paper since the middle ages, back when the process began by pounding rags into a literal pulp. At the end, we got to press our own sheet. Watch wet, pulverized cotton rags become a sheet of handmade paper. Chef Antonio serving homemade pasta. My standards are high on the Amalfi Coast, and Lido Azzuro is meets them. The restaurant is located on the water, along the harbor, away from the crowds. (Are you sensing the non-touristy vibe I wanted?) 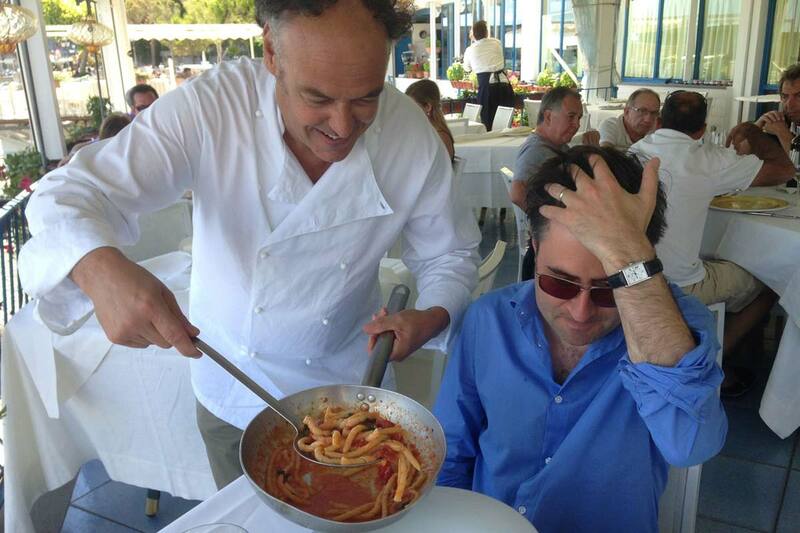 Chef Antonio Pisani is a real charmer: big smile, big open arms, big hair. And his food is a dream. 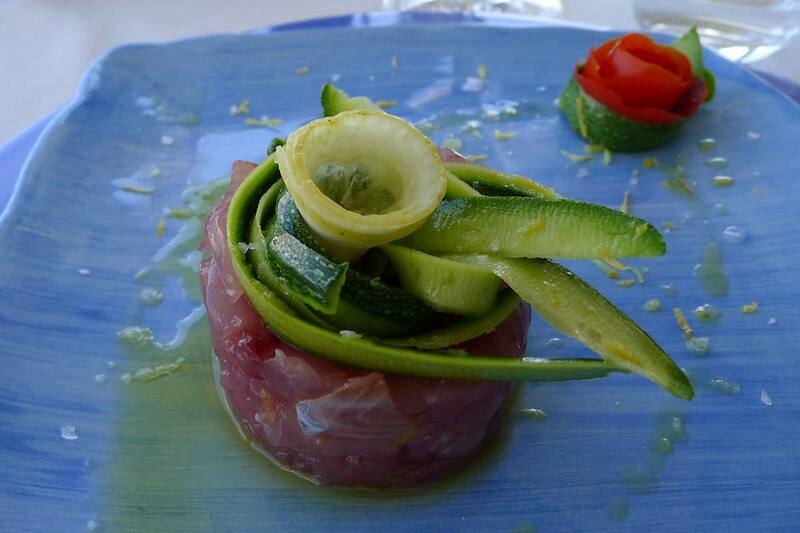 Fresh shrimp with arugula, pasta with fresh cherry tomatoes and basil, spaghetti mussels and clams (yes, two pasta courses for lunch), tuna crudo served with a tangle of zucchini ribbons, fresh figs from his trees, cherries on ice, tangy lemon sorbet. It's almost laughable to list the Duomo di Sant' Andrea as a thing to do. Like you could miss it! The imposing church looms over Amalfi's main piazza, its black and white stripes evidence of its Arab influences. Not that the Arabs were the first here: Records date the first church on site to 596 A.D. ( about its past.) Even if you're not religious, the cathedral, crypt, and cloister are magnificent historical structures. And the relics of Saint Andrew the Apostle add a frisson of the medieval macabre. If you are spiritually minded, the cathedral is a good place to pause to be grateful that the good and gracious fates saw fit to deliver you to Amalfi.